Shahjahanabad: The Dilli that Delhi can never be! Walking down the serpentine lanes of Purani Dilli, you enter a different world- a world of tender arches and silken hamams, of age-old kebab shops and bustling bazaars. You get to see different people- people with kohl-lined eyes, prostitutes offering discounted deals, spice merchants basking under the early morning sun. 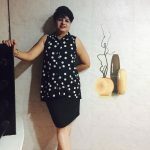 I seek to explore this chaotic yet rhythmic part of our city, focusing primarily on what it revolves around- the Qila-e-Muala, or the red fort. The Imperial court of the Mughals shifted from Agra to Delhi during the reign of Shah Jahan. 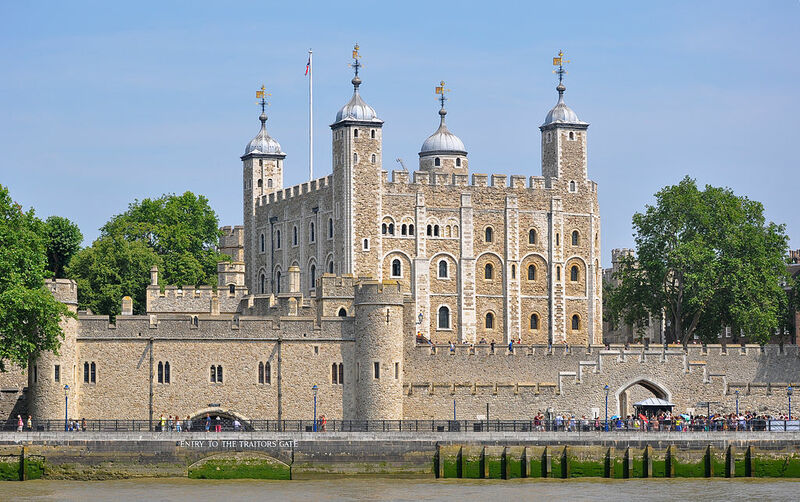 The foundation of the new city was laid in 1638 and was ready for habitation by 1648. Francois Bernier, the seventeenth-century French traveller, blames the blazing heat of Agra for the shift of the capital. The geographical location was of immense strategic importance since the Yamuna flowing by the fort formed a natural moat guarding the bastions. The emperor’s much-loved city came to represent the pinnacle of Mughal architecture, that chiseled tip of refinement and elegance which remains unparalleled till date. Shahjahanabad was also dotted with the mansions of the nobility, royal mosques and public works, Persian gardens and caravanserais (inns), gateways and bazaars, and the humble dwellings of the common man. 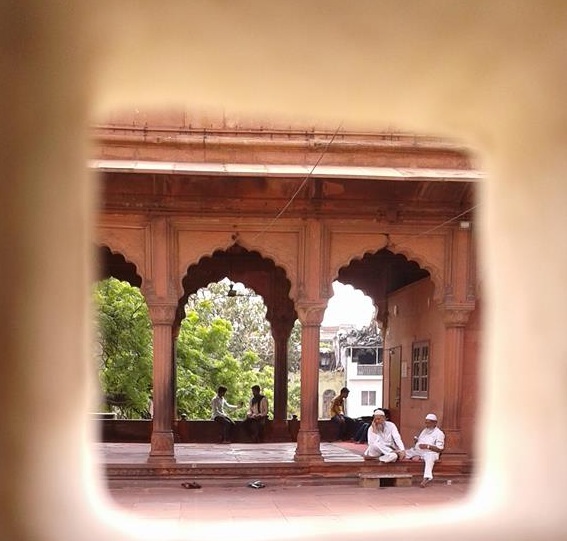 Sneak-peek: The laid back world of Shahjahanabad, where the refinement of silence speaks. Within the walls of the city, was the emperor’s fort-palace, Qila-e-Muala (the exalted fort), a microcosm of the vast Mughal empire. The entire citadel developed around this nucleus, and the palace came to represent the power of the Mughal emperor and his central authority. Muhammad Salih Kambu, a courtier of Shah Jahan, writes that the walled city of Shahjahanabad ‘enclosed the centre of the earth’. The Mughals propounded an imperial ideology based on the Turko-Mongol notion of kingship, in which the emperor is believed to be endowed with the divine right to rule. According to a legend, he carries a divine light and passes it on to his heir, who then becomes the source of spiritual guidance for his subjects. Like the residence of the ruler, his throne (takht) is the centre of the court. 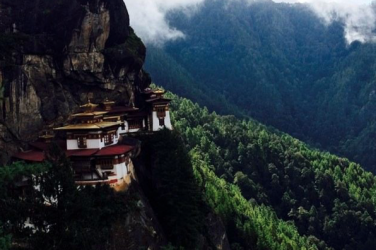 It resembles the ‘axis mundi’, the link between the cosmic world and the earth. 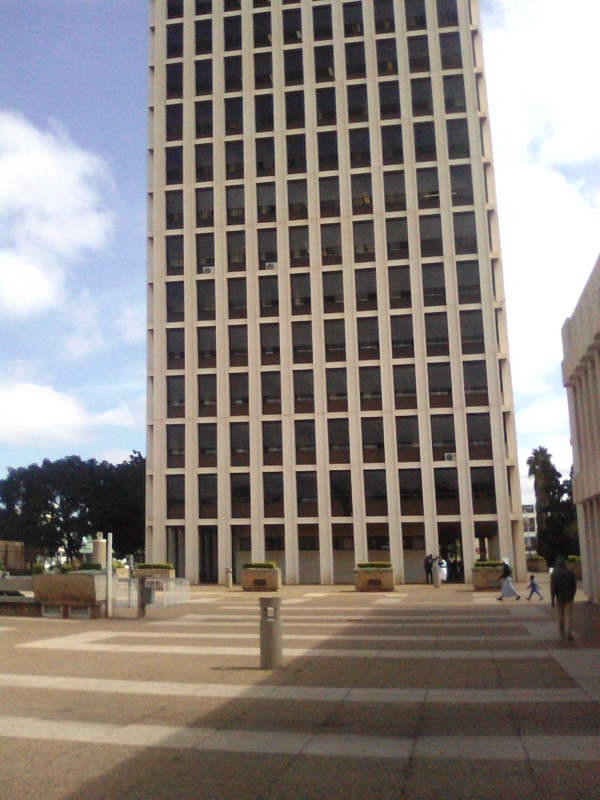 Architecture was often used as a metaphor for sovereignty and power in state-societies, especially in monarchies. And hence, built spaces were deliberately organized to convey the ideology of the ruling class. 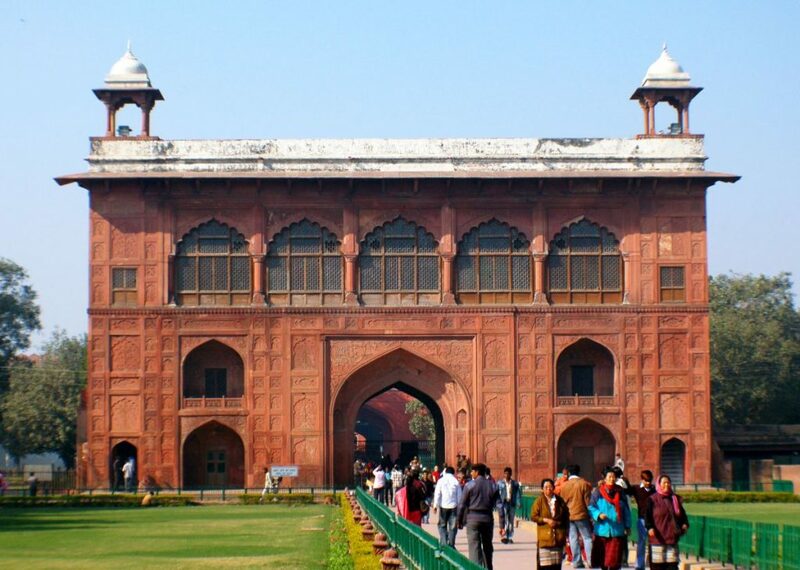 The emperor’s fort-palace, which is commonly called the Red Fort, was built by two master architects, Ustad Hamid and Ustad Ahmad, under the supervision of the emperor himself, who was an architect and aesthete in his own right. 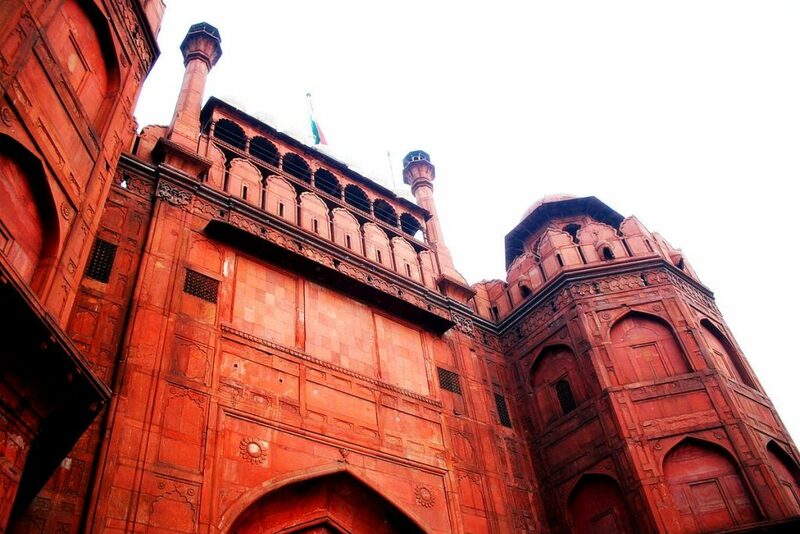 The Red Fort shows a confluence of various architectural styles — Timurid, Persian, Hindu, Pre-Mughal, and European. The red sandstone ramparts that run around the fort, making it a protective unit, is interspersed by the massive Delhi Gate and the Lahori Gate. The Lahori Gate is crested by a row of chhatris, capped by marble domes. 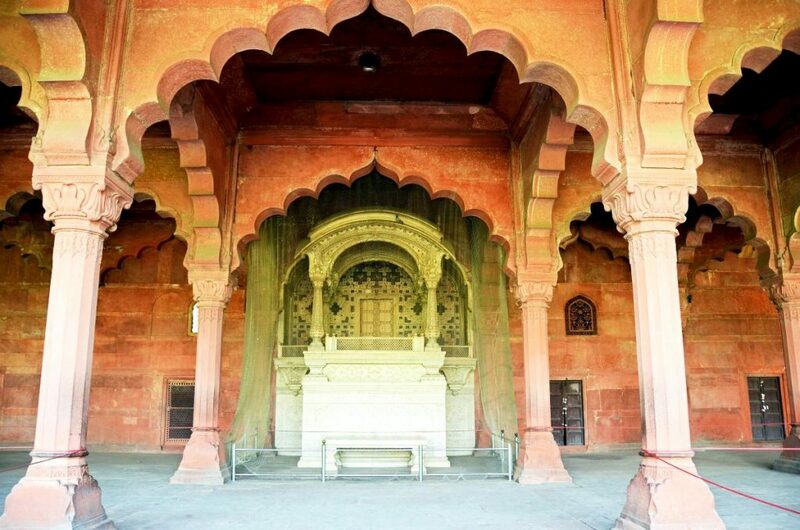 Shah Jahan used white marble in combination with red sandstone to produce distinctiveness in style. The layout of Chandni Chowk was made by the emperor’s favourite daughter, Jahanara. As historian Madhu Trivedi notes, long before the European towns started having boulevards, Shah Jahan’s pre-modern city had a wide tree lined avenue that would come to life in moonlit nights. 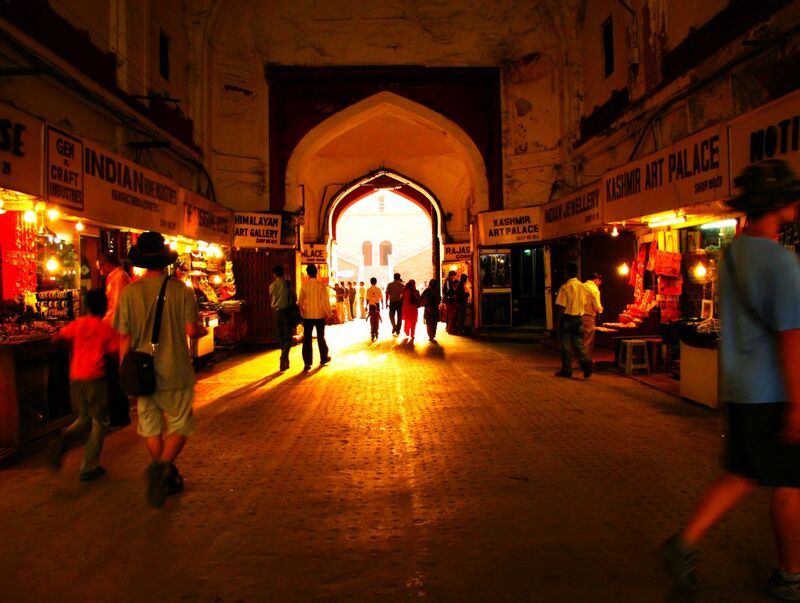 The bazaars of Shahjehanabad would bustle with people in their heydays. The Chhatta-Chowk inside the fort, which has been quite poetically called Bazaar-e-Musaqqaf (covered bazaar) by Muhammad Salih, was mainly used by the women of the harem. Therefore the best craftsmen flocked to this arcade in order to sell their works to the royal ladies. Shah Jahan planned a covered market to make it easy for the shoppers in the unbearable and hostile heat of Delhi, and drew ideas from the covered arcades in contemporary Persia. Literary sources say that the walls of this arcade were once painted and gilded, but now decadence has given way to a silent white. A grand arch opens into an octagonal court, and this place is called Chhattar Manzil. Next comes the Naubat Khana, with floral motifs carved on red sandstone that appear to be so tender and life-like that you would never want to touch them and disturb their state of harmony. Bernier recalls in his travelogue that the grand, solemn music from the Naubat Khana was played to welcome and bid farewell to the state guests.The next group of structures is related to the primary business of the empire —Diwan-i-Aam and Diwan-i-Khaas. The Diwan-e-Aam. The emperor received members of the general public and heard their grievances. Photo via Flickr. 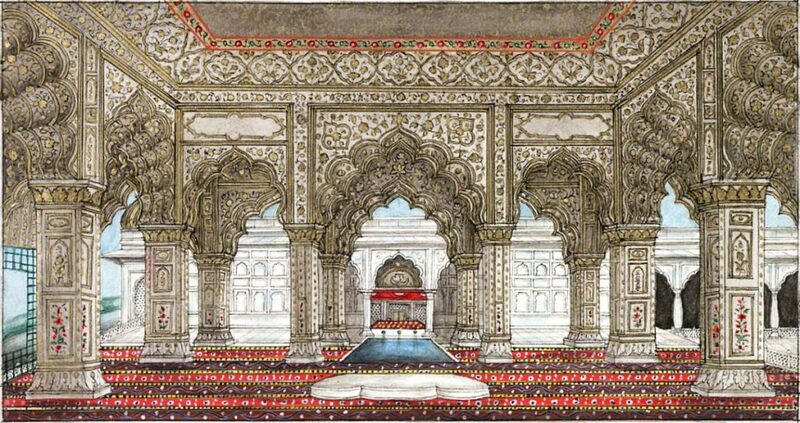 The most noteworthy architectural feature of Diwan-i-Aam is the Emperor’s canopy, called the ‘Nashima-i-Zilla-i-Illahi’ (the seat of the shadow of God), intricately crafted in marble with inlay work. 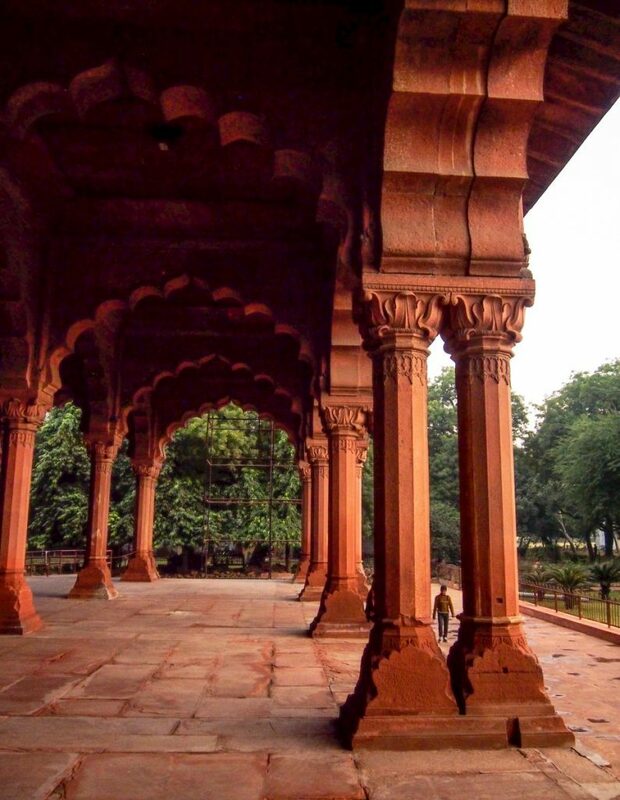 Like many other Mughal structures, it has a curved and sloping Bangla roof with balusters. The acclaimed art historian Ebba Koch opines that the baluster column, a column with a base, pot-like element, shaft and capital, was an European import in Mughal art. Shah Jahan has widely used this column in his palaces in Lahore, Agra, and Delhi. As a functional or utilitarian element, the baluster would support an engrailed or a semi-circular arch. At the back of the marble canopy lies a canvas of white marble. The Florentine jeweller, Austin de Bodeaux, transformed this canvas into a grove of birds. The pictorial mosaic work, especially the one on black marble panels, depict the aviary world beautifully. Different birds sitting on fruit bearing trees would remind one of Jahangir’s love for naturalistic paintings and the magical works of Ustad Mansur. The top center panel depicts Orpheus sitting and playing the lute amid animals, both wild and tame. A lion and a hare, among other creatures, are shown in the panel, listening to Orpheus’s instrument with rapt attention, as if mesmerized by its melody. This panel is an allegory that depicts the uniting power of the Mughal emperor. 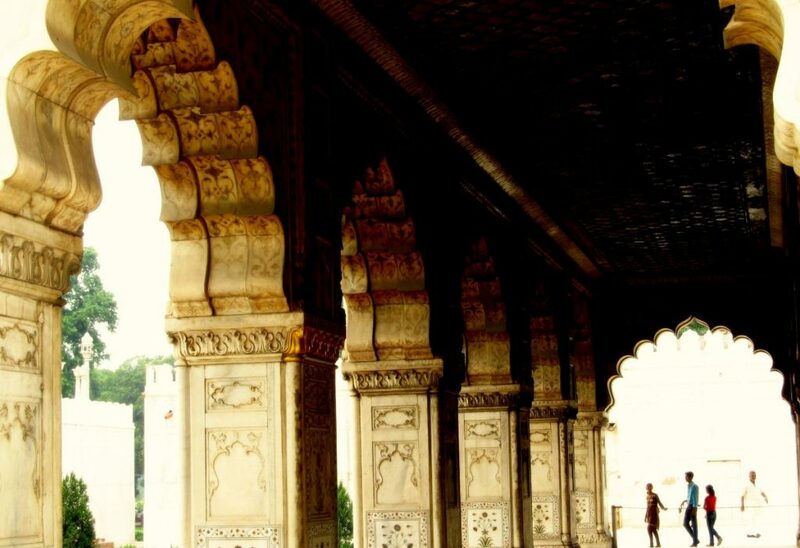 The Diwan-i-Khaas, with its marble arches and cupolas, look sublimely serene from outside. The interiors, contrastingly reflect the opulence of the empire. The ceiling was inlaid with gold and it was painted. The piers in the hall have mosaics of carnelian, lapis lazuli (a rock consisting of lazurite), rubies and corals, besides the stunning pictorial mosaic work. Traceries and filigreed screens allow the sunlight to filter in. The famous water channel called Nahar-i-Bihisht runs through the center of the Diwan-i-Khaas. The Bihisht, which means the ‘stream of paradise’ was a water channel running through the palaces and pavilions in the fort. The water for this channel came from the Yamuna. It starts its journey from a marble alcove in Shah-Burj, a pleasure pavilion of the emperor, flows through the Hayat Baksh gardens, running through hammams (royal baths), palaces, scalloped basins and fountains. The serene waters of Yamuna would have created an ethereal air in the delicate palaces of the Mughals — imagine the mellow sound of tripling water accompanied by the gleam of candles in crafted chirag-daans! Nearly every chamber has its reservoir of running water at its door; on every side are gardens, delightful alleys, shady retreats, streams, fountains, grottoes, deep excavations that afford shelter from the sun by day, lofty divans and terraces, on which to sleep cool at night’, writes Bernier in his book ‘Travels in the Mogul Empire,’ who is usually very critical of the Mughal state. Shah Jahan’s planning and aesthetics rarely fail to impress people, even the coldest of hearts return enchanted from his beloved city. Shahjahanabad accommodated the various strands of architecture to form a unique fabric of its own. The common man lived in temporary houses, which were vulnerable to fire and had fallen prey to this hazard. As the city was overpopulated, the dwellings in settlements were in close proximity to each other, and even now one can feel the shortage of space. 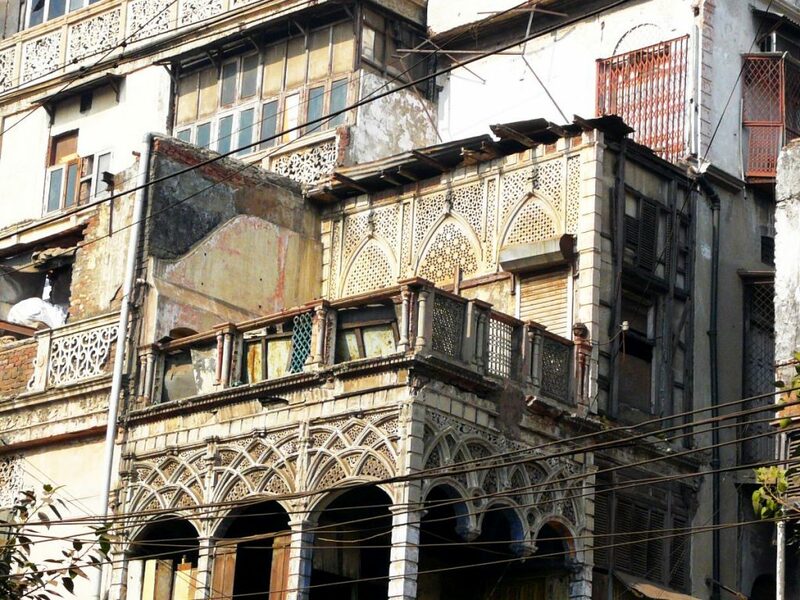 The area around Chandni Chowk also had the mansions of the Mughal nobility — typical courtyard houses with a grand gateway (deori). Shahjahanabad was invaded and ransacked thrice — by the Persian ruler Nadir Shah (1739) who carried away the splendidly crafted ‘takht-e-taus,’ or Shah Jahan’s favourite peacock throne; by the Rohillas and the Marathas in the eighteenth century; and, finally by the British during the revolt of 1857. With the decadence of the Mughal dynasty, the court began to disintegrate. In absence of serious patrons and connoisseurs, the architects and artists migrated to the provincial states such as Awadh, Murshidabad and Rampur. After the British occupation of the city, especially during the nineteenth century, the Jain merchants of Delhi prospered in trade and started building havelis, which now form the streetscape of the old city, in their quite deplorable state. The Jain traders re-introduced Rajasthani elements in Delhi’s architecture. Some degree of artistic exchange between Rajputana and Dilli had taken place over the politics of marriage alliances, state paramountcy, and the mansabdari system. The long running verandahs of these havelis, their austere courtyards, and heavily decorated drawing rooms mark a period of socio-cultural transition. 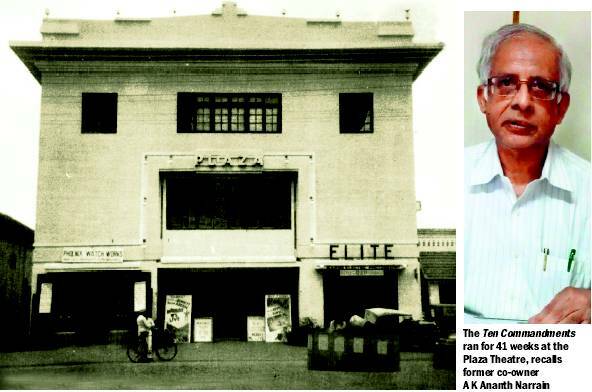 And the cultural change continues, but something keeps Purani Dilli rooted to its past. It has attained a meditative deep-rootedness inspite of being enveloped by the crowd and its chaos, much like the serene waters of the Yamuna in times of turbulent storms. In the wise words of D.H.Lawrence, I am a "tremulation on the ether." This gypsy soul is a student of History (DU), the subject being his amor primus. Loves to travel across time and reconstruct the past. Is a dream weaver and seeks solace in the shady bowers of literature. Anthropology and archaeology intrigues this person,and his keen interest in folk arts and tribal social structures allowed him to serve as an intern at the Daricha foundation. His life is set to the tunes of Hindustani Classical music, and is a disciple of Padma Vibhushan Dr. Girija Devi of the Senia-Banaras gharana.